When you are shopping for a vehicle to get you to work and back each day, you should think about buying an SUV. The team here in Las Cruces is excited to show you some of the benefits of driving an SUV. An SUV can keep you safe in ways that a compact car will not. 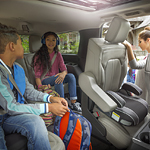 There are safety features that are built into an SUV that can protect you, and the large size of an SUV can help you stay safe, as well. When you have cargo that you need to take with you, an SUV allows you to haul that right inside your vehicle. We want you to understand just how special an SUV is and just how such an automobile can work out for someone like you. If you think that you might be ready to try out an SUV, come to Pitre Kia of Las Cruces and we will get you out for a test drive.